House shopping 101: Perfect playground or accident waiting to happen? Don’t expect your new house to be completed on closing. I think the new housing market is unique in that it is one of the few places where you are expected to pay full price for an unfinished product. It is almost universal across the GTA that upon closing, landscaping is not complete, and if there is a deck at the rear, the deck will not be fully complete and ready to use with stairs. 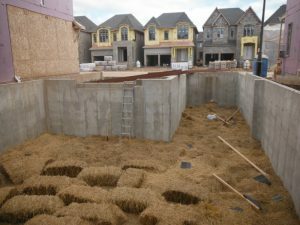 Downspouts, if installed, will be discharging water close to the foundation, and the driveway surface is not installed. Exterior painting is often unfinished, and lately I am finding even roofing work is incomplete. 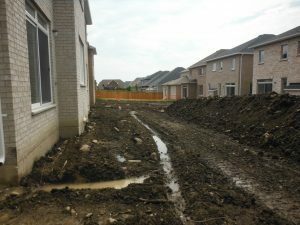 As I inspect these new houses for 30-day warranty issues, tromping through the mud brings back childhood memories of playing in piles of dirt and riding our bikes on improvised mud tracks pretending we had engines on them. I love the smell of the dirt and looking for gems that might rise to the surface. Every once in a while, I find a nice looking local rock that I throw in the back of the truck. The tracts of mud that are the precursors to back yards would have been the perfect playground for me. Not to mention the allure of climbing over partly built houses and foundations and trying to lift heavy steel beams. But 50 years ago, if a kid fell off their bike and got hurt it was considered part of growing up, not fodder for a lawsuit. 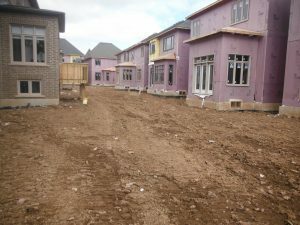 I am surprised that builders expose themselves to the potential risk of children or others getting hurt at these back yards that are active construction sites. I know the sites are riddled with video cameras, and fully expect the rock police to show up at my door one day, but a video camera doesn’t stop an 8-year-old from jumping off a foundation wall to test their parachute. I am leaving out the fact that I have never seen a child playing in these areas. I am the only one. It seems nobody wants to come out and play with me. The other kids have video games and electronic devices that I don’t, and it’s a long walk from the flat screen to the backyard. Is there a house shopping tip to be had? Be prepared for the unfinished house and a year of mud and dust, and make sure you buy the bikes with the fat tires. Keith Tripp lives, works, and plays in Toronto, Ontario, Canada.